Real populations rarely exist under the rigid conditions of the Hardy-Weinberg Equilibrium. Instead, gene frequencies in real populations change randomly with time through genetic drift. An alternative form of a gene; one of the different forms of a gene that can exist at a single locus. changes over generations due to random chance. Evolution due to genetic drift is not caused by environmental or other kinds of stresses on individuals, and the resulting random changes can be detrimental, neutral, or beneficial to the reproductive success of the following generation. The complete set of unique alleles in a species or population. and are often overshadowed by natural selection, genetic drift working in small populations can quickly result in big changes. Suppose you have 6 oysters, 3 dark-colored (AA genotype) and 3 medium-colored (Aa genotype). In this population, you have a total of 9 A alleles and 3 a alleles, or 75% A and 25% a. The observable physical or biochemical characteristics of an organism, as determined by both genetic makeup and environmental influences; what an organism “looks like.” (adj. phenotypic) — doesn ’t matter.) No "evolution" (change to the gene pool frequencies) has occurred. 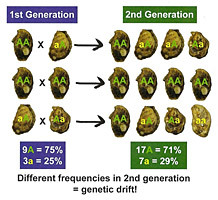 However, if the oysters mate unequally, due to random chance, it is very easy to end up with different proportions, such as 17 A alleles and 7 a alleles (or any other combination). 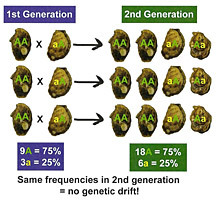 Random chance thus can result in an inherited change (of allele frequency) within the lineage, thus we say that evolution has occurred through genetic drift. Genetic drift observed in a population that was founded by a small non-representative sample of a larger population; also called the “bottleneck effect.” (or “bottleneck effect”). When a small part of a large population is removed from the main population, this "founder population" might have a very different allele frequency than that of the original. As the founder population reproduces in isolation, the gene pool of the population will continue to diverge from that of the original population. If you have a large oyster bed of 100 oysters, composed of 50 dark-colored (AA) and 50 medium-colored (aA) oysters, that population has 75 A alleles (75%) and 25 a alleles (25%). 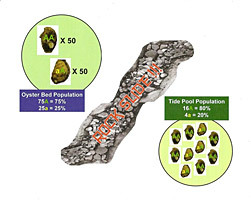 Let ’s suppose that a rock slide isolates a small group of 10 oysters in a tide pool (thus separated from the main population) and that this group has only 6 dark-colored (AA) and 4 medium-colored (aA) oysters. In this tide pool population, there are 16 A alleles (80%) and 4 a alleles (20%) — the new gene pool is different from that of the original population as a result of the random rock slide. 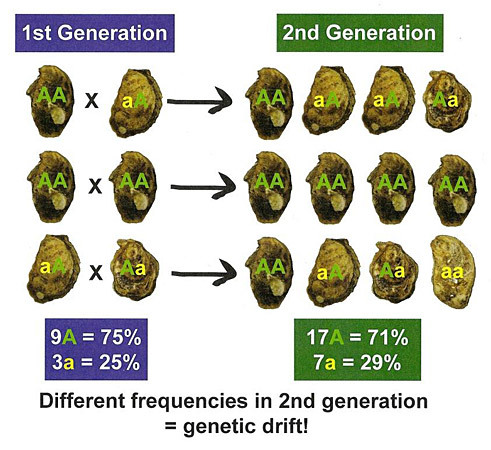 As the population in the tide pool reproduces over time, genetic drift can further change the allele frequencies, becoming more and more different from the proportions in the original oyster bed.